I've just discovered this great resource, and I'm looking for a specific cartoon from many, many, years ago. It's for my daughter who has just almost set fire to her kitchen whilst hard boiling some eggs .... the pan has gone in the bin, as have the eggs!!!!! Many thanks, in advance, for any kind assistance which you may be able to offer. Hold fast - I'm sure the Marvellous Encyclopedic Mr Baker will be with you shortly. If anyone can help you, he can (unfortunately, I'm as much use as a chocolate teapot in this instance, but I enjoyed your post ). I'm pretty sure we based the idea for that apron on a strip that had already appeared but if Rob Baker can't find it, then it probably doesn't exist. Despite owning one of those aprons for 20 odd years, I've just noticed something for the first time. 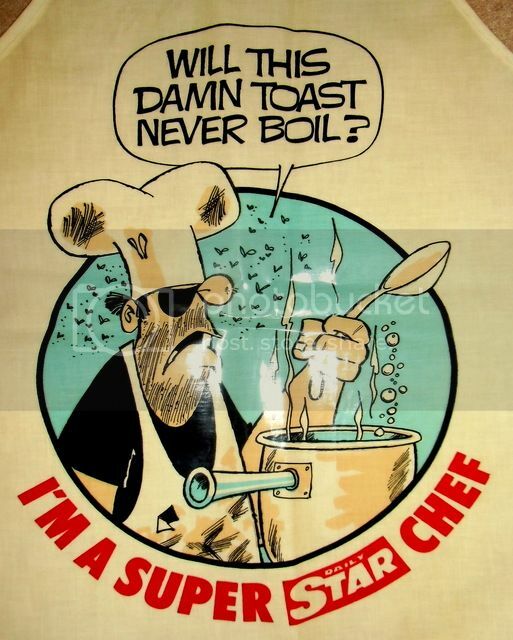 The caption reads "Will this damn toast never boil?" The bubbles rising from the pan would suggest that it is, indeed, boiling. So you're saying you can boil toast? Of course you can. You're obviously not much of a cook. Ah, I see where the inspiration for the Beau Peep strip comes from now.
. . . and the inspiration for Dennis. ...and the inspiration for the bowl of that amazing genius, Mince.